Hey guys, what's shakin'? 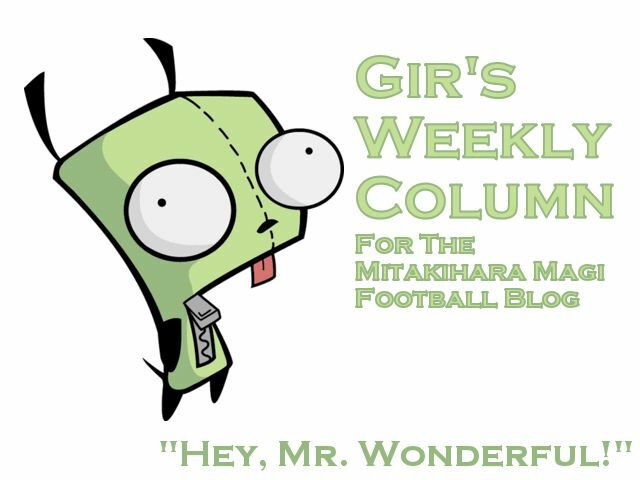 It's your buddy, Gir Todafunk, the great-grandson of the Legendary Rocker of the Free World A, here with you with a special Wednesday edition of my Weekly Columns. I am here at the Hard Rock Live Hotel at Universal Orlando ahead of the 2053 Home Depot College Football Awards Show, staying in comfortable confines with Bo, Nyaruko, Bryan, Nick, and some notable seniors. A few of them, namely Haru, Takumu and DeMarcus, are going to head to New York City following the Awards Show for the Heisman Trophy Presentation. I'm not concerned about the Heisman Trophy, thought. I'm concerned about whether or not one of the other lunatics on the Cornerbacks Crew nabbed the Jim Thorpe, which is what I'm aiming for. I know Haru will have all but sewn up that Heisman, good for him, and LaRon Wright gets the Bednarik, Nagurski and Lombardi, triple good for him. As for the Thorpe, it's a wide-open race between be, Bo, Bryan and Nyaruko. Also known as Nathan Sims. If one of those three ends up winning the Thorpe, he's gonna have to buy the rest of us dinner back in M-Town. Wagyu, bacon-wrapped, with all the trimming. But if I win...dinner at Ika's is on me. The original of Ika's, Ika-Musume, or the Squid Girl, returned to the ocean a few decades ago. The current owner is Sanae Nagatsuki, who earned her management degree at Madoka and has been the proprietor of the place for year. She and her husband, Goro Arashiyama, have owned Ika's for two decades. They have three sons: Kaz, Roy, and Decker, all who have been standouts on the Magi baseball team and who now work as waiters and assistant managers to Sanae. The Arashiyama brothers are majoring in management and are seniors. I'm personal friends with Decker because he used to be one of my personal tutors regarding History assignments. Whenever I have free time, I do stop by Ika's to chat with Decker and talk about the team, the baseball boys, the home runs, the RBIs...and the Vancouver Canadians, the powerhouse of the Northwest League. Decker loves the football, and I sometimes talk with him after the game about the plays I made, and about the other numbskulls on the Cornerbacks Crew. All I can say is that the future of Ika's is in good hands because of the commitment of the Arashiyama brothers. And if I win the Groza, the whole crew's gonna feast on some shrimp and crab and all that good stuff, all on me. But the real reason why I'm over the moon is this: we're facing Notre Dame in the BCS National Championship Game. UCLA and Miami lost this past weekend, and that left the door wide open for the Irish. Once again, the Battle of the Angels is renewed. I cannot wait to take on the original Division I Football Bowl Subdivision Independent powerhouse. Notre Dame, to me, is one of the most successful football teams over the past two centuries. So it's important that we put up a good fight against ND and deliver.